Substrate is a complex variable of the physical environment. Often we think of substrate in terms of the material of the streambed, including the cobbles and boulders of a mountain stream, and the mud and sands that are more typical of lowland rivers. Current, together with available parent material, determines mineral substrate composition (Chapter 3). There are, additionally, many kinds of organic substrates in running waters, from minute organic fragments up to fallen trees in size, along with rooted plants, filamentous algae, even other animals. In essence, the substrate includes everything on the bottom or sides of streams or projecting out into the stream, not excluding a variety of human artifacts and debris, on which organisms reside (Minshall, 1984). There are instances where substrate is relatively uniform, as in sandy bottoms of low-gradient rivers, but usually it is very heterogeneous. For benthic organisms dwelling on the surfaces and within the crevices and interstices of the streambed, substrate provides the platform and living space where they attach, forage, and complete most or all of their life cycles, as well as find refuge from current and enemies. Periph-yton and biofilms usually are more productive on stable substrates (Section 6.1.1) and invertebrates achieve greater biomass and diversity on some substrates compared to others. Substrate is a critical component of fish habitat for foraging, sheltering from current, and spawning. However, it often is difficult to identify just how substrate affects organisms because it interacts with so many other variables, especially current. In Figure 5.1, for example, the habitat preferences of several benthic invertebrates are shown as a function of current velocity, but substrate preferences also are evident, and in some instances appear to vary with current. The size of inorganic particles is easily measured and can be summarized with a single term such as median size, but one cannot easily average observations of, for example, moss, rocks, and submerged wood. As a consequence, substrate typically is described by the relative amount of various categories. Even when quantification seems straightforward, such as estimating median particle size or the volume of wood per linear stream distance, there may be uncertainty concerning what feature of the substrate is important to the biota. Is it the size of a stone that matters, its surface area and texture, or the interstitial spaces and how tightly stones are packed together? 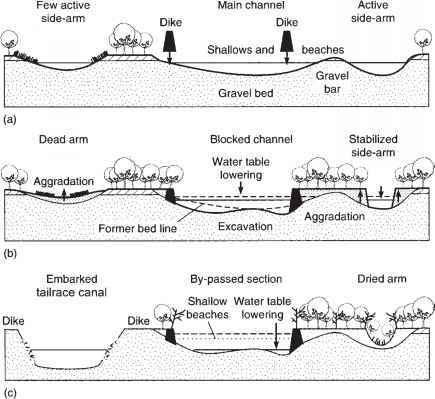 Quantification of substrate is further complicated by its spatial heterogeneity, both vertically and horizontally within the streambed, and because substrate can change over time in response to fluctuations in flow.